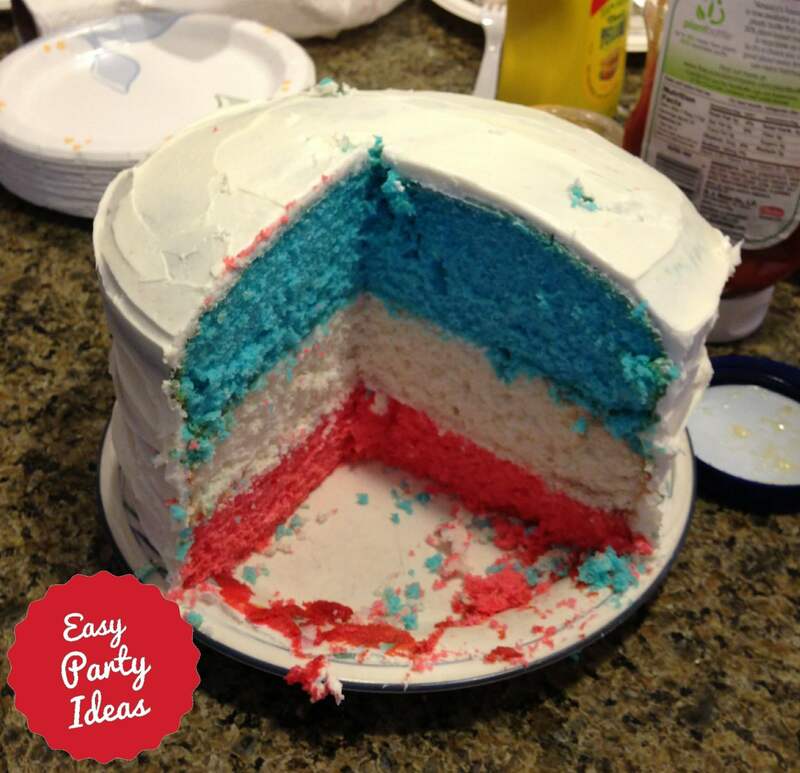 Making and serving a 4th of July flag cake or patriotic cake can be lots of fun - and here are some decorating examples for your Fourth of July Party. Cover cake with whipped topping. 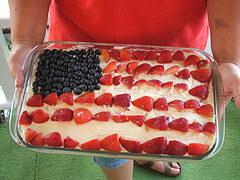 Place strawberries and blueberries on whipped topping to create a flag design. 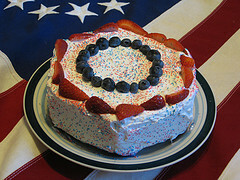 This is a "Firecracker Cake" - named after the "firecrackers" on top. The firecrackers are made out of marshmallows on a skewer that have been coated with red, edible spray paint, and then topped with a flattened, round gummy yellow candy. Coming out of the firecrackers is red licorice. 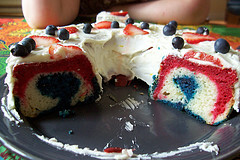 Inside the cake, the layers are red, white and blue! 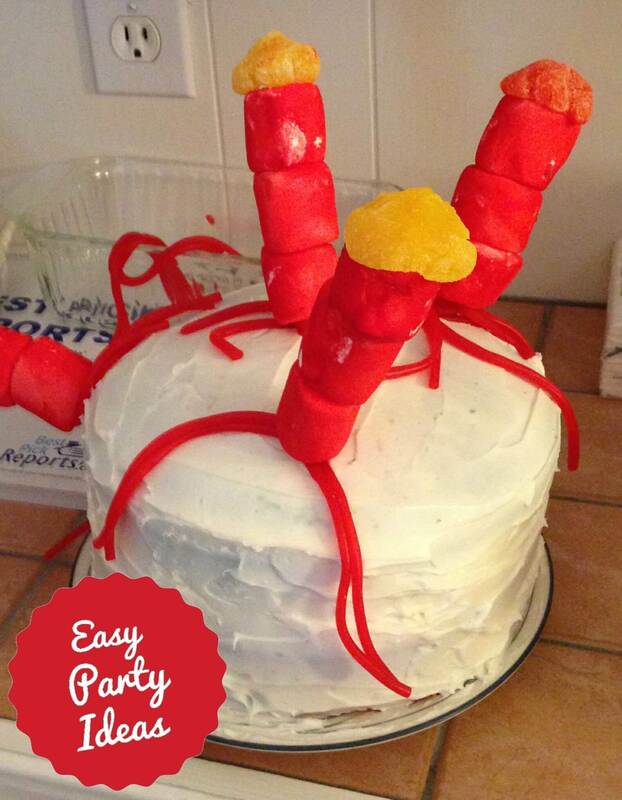 Make a white cake with three layers, and before baking each layer stir in some food coloring! Even if you choose a different design for the outside of the cake, doing the inside like this makes a very patriotic cake! Decorations really set the mood for a party, and an Independence Day Celebration is no different. Go with red, white and blue, and you can't go wrong! These links will connect you to some great opportunities to shop online. face paint - Children and Adults will enjoy getting their spirit on in this way! Patriotic Pinwheels. - stick these in your yard, in floral arrangements, and all around the house. Kids will have fun with them too! Patriotic Fans - to help keep you cool! Patriotic Star Pinata - pinatas are always fun, and they double as a deccoration. Fill yours with red, white and blue candy! Patriotic Fabric Bunting - a must! Drape everything with it! Need more ideas? 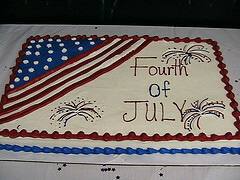 Check out this page I have compiled of my favorite Patriotic Decorations.